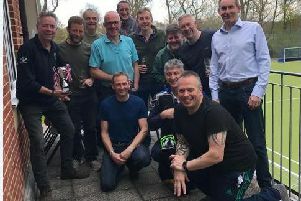 Chichester travelled to Weybridge for their return Premier Squash League match against St George’s – only for their hosts to complete the double. Chichester lost 5-0 in the home game so knew it would be tough, and so it was. All the matches were played on the all-glass court, which favoured the home players. Miles Jenkins, for Chichester, struggled to get to grips with conditions and was always playing catch-up against former Chichester player Robbie Temple. Temple’s deceptive play had Jenkins constantly on the back foot and, as hard as Jenkins tried, Temple came through 2-0 to put St George’s 1-0 up. Chichester’s Lauren Briggs had a similar problem against Jazz Hutton, whose pace and tempo completely took Briggs out of her comfort zone as the 11-3, 11-6 scoreline suggested. Tom Walsh (Chichester), meanwhile, had a close game with Carlos Cornes. Both games were evenly contested and each player played with a similar style and attacked well. Cornes played the big points well and took a 2-0 victory to give St George’s a match-winning 3-0 margin. Next on court the No1 strings, Chi’s Mathieu Castagnet (world No24), took on Tom Richards (world 21). This was, undoubtedly, the best match of the night. It swayed both ways with Castagnet and Richards attacking well and using the front of the court well. Richards took a tight first before Castagnet forged a lead in the second and despite a brief flurry from Richards towards the end of this game, he managed to close it out. In the deciding game Castagnet pulled away to win, the final score 11-7, 7-11, 6-11, saving Chichester from a whitewash. The final match was between Tim Vail (Chichester) and Borja Golan (world 32). Vail started well, playing patient squash and mixing the pace well. At the halfway point Vail made a couple of bad shots and suddenly the game suddenly slipped away. Chichester have two home matches now, on March 5 and 19. Tickets are available at Chichester Racquets & Fitness Club – call 01243 785664.